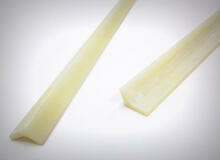 G7 is a Glass Cloth Silicone and an excellent choice for high-temperature applications. NEMA grade G7 laminates have excellent electrical properties and may be used in applications up to 200 degrees Celsius/392 Degrees Fahrenheit. It can withstand a maximum operating temperature of 465 Degrees Fahrenheit. Micarta® G-7 machining is an area in which Vanderveer Industrial Plastics excels. Vanderveer Industrial Plastics utilizes ILNorplex materials, and as a result, they machine without difficulty. Several grades of G-7 are available. For additional information on G-7 plastic materials, contact your local Vanderveer Industrial Plastics representative or call Vanderveer Industrial Plastics at 714.579.7700.